Learning centers in the elementary music classroom can prove to be beneficial, even when there is limited time and resources. Centers can be defined in various of ways. Centers are musical activities that are located in specific parts of the classroom. 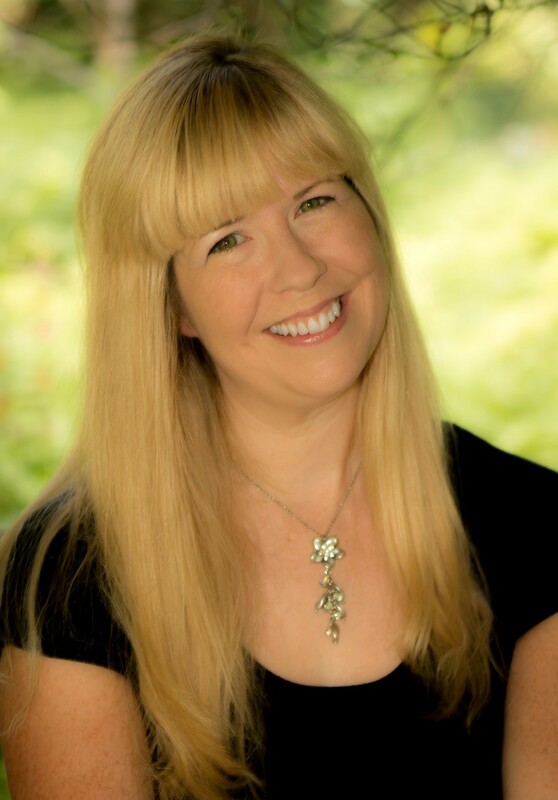 They usually include composing music, making music, note reading, rhythm reading, creating music, performing music, moving to music, acting out music books and song tales, and drawing to music. 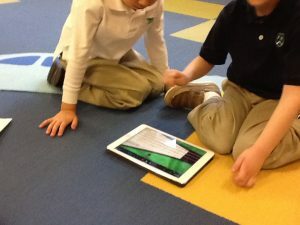 How can technology enhance an elementary music center? 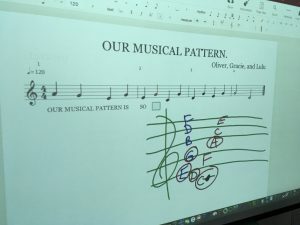 If your center has one or more devices such as Chromebooks, laptops, or desktop computers, students can compose music using Noteflight, the free cloud-based notation program. Depending on the age and the size of the group, you can create a song with a repeated note and rhythm pattern. Each student must change the measure to the guided notes, such as sol, mi, la, or as in this example, do, re, mi, sol, and la. The students highlighted the note and used the arrow keys to change the notes to the guided pitches. I have done this with students in grade 2, in groups of three and four on one device. Using one device that has internet access (iPads, Androids, Chromebooks, laptops/desktops) and boomwhackers, bring up Musication’s channel on Youtube. Select a song that would be appropriate for your students to perform. Have them follow along and perform the song. For reading and performing rhythms, try Professor Pedro Morales Youtube Channel. One of our favorites, though a bit early to play right now, is Leroy Anderson’s Sleigh Ride. To prepare the students for this activity, I would have had the students practice reading and performing with the rhythm patterns found in the activity. These are not too complex for this song as they include quarter notes and quarter rests. This is excellent for younger elementary students. YouTube Tip #1: If the tempo is too fast, click on the settings button and change the speed of the video. YouTube Tip #2: Can’t use Youtube in the classroom? Then when you are at home, place “ss” before “youtube” in the url. For example, https://www.ssyoutube.com/watch?v=JWHolFvsc38&index=24&list=PLK99GB80qm214GWOZmDRrGnIE8hiu_zNM. This will bring you to savefrom.net where you can download the video to the hard drive or to a thumb drive that you can use in your classroom computer. YouTube Tip #3: Place the youtube video’s url into safeshare.tv or viewpure.com. This will generate a new url for you that takes out the ads and comments from the youtube videos. Both services also have free subscriptions where you can save the videos to playlists, customize urls for the videos, and allow you to use a portion of the video instead of the entire video. The free subscriptions are limited in how many videos and playlists you can have. YouTube tip #4: A paid subscription to YouTube Premium (formally YouTube Red) will give you ad-free videos and their new music-streaming service. 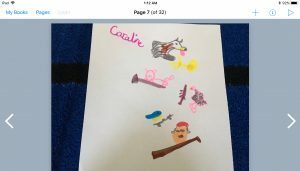 3rd grader submitting recorder work using Seesaw. Utilizing one device that has internet access, your students could perform a recorder song at the center. This could be a song that they are learning to earn a star for their strap or belt. 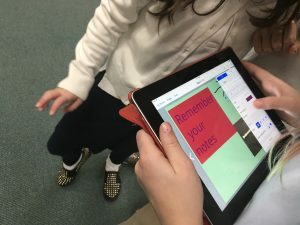 Once they have practiced the song, they access their Seesaw journal (Seesaw is a free digital student learning journal), video their song, and post it on their journal. No one will be able to see it until you approve the post. You can watch the video and give feedback. The next time the student accesses their journal, they will see your feedback. 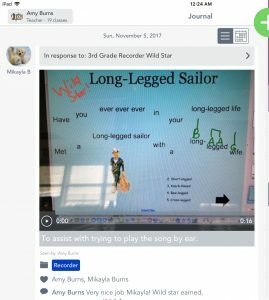 In addition, Seesaw can be accessed by the student’s caregivers where they can view the video and give feedback (all with teacher approval). 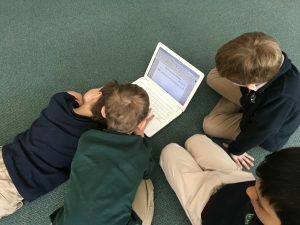 Similar to Seesaw, Flipgrid is a free “website that allows teachers to create “grids” of short discussion-style questions that students respond to through recorded videos. Each grid is effectively a message board where teachers can pose a question and their students can post 90-second video responses that appear in a tiled “grid” display” (Kievlan, 2018). At this center, the teacher could create the recorder grid, post the directions as a video, and the students could submit their recorder videos to the grid. Using one device or more that could be Chromebooks, iPads, or laptops/desktops, have the students play Staff Wars. Set the game up for a certain staff and certain notes (I usually set it up for line or space notes in the treble clef staff). Have each student play and keep track of their score. They name the note that flies across the screen. If they are correct, the note explodes and they will eventually level up. If they are incorrect three times, the game ends. My students love this game. Created by Craig Gonci, you can download the free version of Staff Wars to your laptop/desktop here. If you have iPads, you can purchase the app here. If you have Android devices or Chromebooks that allow Google Play apps, you can purchase the app here. And if you have a Kindle Fire, you can purchase it here. The app is .99 for iOS, Android, Chromebooks, and Kindle Fires. 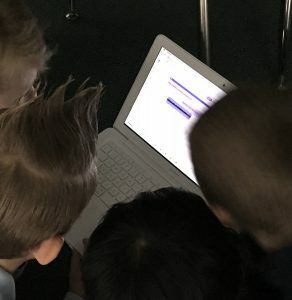 When I want to assess my older elementary music students on items that they learned last school year and items that they will be learning this school year, I use two technological tools: Socrative and Google Forms. I use Socrative for formal assessment. I create a free teacher account and a classroom name. I then create a multiple choice pre- and post-test for the students to answer. When the students come to the center, they enter the classroom name, input their name, and begin the assessment. When they click finish, the results come to my account and I can access them at any time. In addition, the next student just needs to enter the classroom name to begin their assessment. As long as I have launched the assessment, it stays live and will allow any student to take it, until I turn the assessment off. In google forms, I can create an assessment that does not need the students to have a google account to take the assessment. To do this, click settings and do not check “Limit to 1 response”. The benefits of google forms is that you can easily use google images, youtube urls (and specify which portion of the youtube video), and items in your google drive because these tools are built-in to google forms. Here is a form I created for my older elementary students so that I could begin to connect with them at the beginning of the school year. I like to use google forms because my students in grades three and up utilize google classroom. In the next month, google classroom will become much more intuitive with creating and placing google forms directly into google classroom. I am looking forward to this! Using one device at a center, play music that the students can move to. Some of my favorites are the Move It! dvds from Dr. John Feierabend and the movement activities from Denise Gagne’s Musicplay. 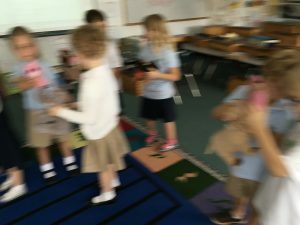 In this example, my kindergartners have their beat buddies and are moving with them to the steady beat using music from Dr. Feierabend’s First Steps in Classical Music Keeping the Beat CD. Music tip: Many devices no longer have CD and DVD drives. One solution is to purchase an external drive for the device. Another solution is to subscribe to a music streaming service that the school purchases for you to use in the school. Apple Music, Spotify, Amazon Prime Music, Amazon Music Unlimited, and YouTube Music to name a few. Using one device or more that could be Chromebooks, iPads, or laptops/desktops to play music, give the students a prompt or guidance to draw to the music that they are hearing. They can use traditional tools to draw, such as paper, pencil, crayons, markers, etc. To level up this center, have them use the device to video themselves talking about their drawing. They can also talk about how the music made them feel and the connection between the two. 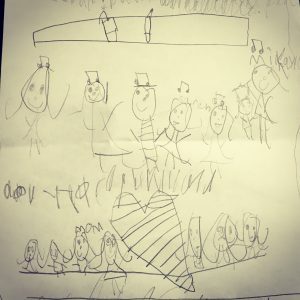 I love looking at this drawing a first grader did and seeing how the music notes intertwined with all of the people. I believe that the music playing was one we used for folk dancing, but I did this on a spur of the moment and loved the results. This also could be done in a Peter and the Wolf center. The students could draw the story that they are hearing. Here is an example of this activity from one of my first graders. This was turned into an ebook using Book Creator, a free ebook creation tool. My students have also used it to create ebooks about recorder tips. Using iPads, you can have students use GarageBand to create music within a specified form and style. I have also used it for young students to utilize the virtual instruments. We do not have access to a Chinese Pipa, but there is one in GarageBand. They loved creating their own song for the Chinese New Year. Another wonderful app and website to create music is incredibox. My students love to use incredibox to create beatboxing backgrounds to accompany the classroom rules (The Rules Rap) or to poetry they have written as apart of their poetry unit. Finally, an amazing music creation web-based tool is Soundtrap. Soundtrap is free, however, I recommend the subscription EDU version for school use. Soundtrap is like GarageBand but most devices can run it with internet access. Soundtrap has a fabulous collaboration tool so students can create music together from across the globe. These center activities can take from 7 minutes to 30 minutes, depending on the timing, the class size, and the other activities that are going on at the same time. When it comes to some of these activities, it is beneficial to prepare the students ahead of time on how to utilize the technology. The pre-test would be an example of this. However, these have been successful in music classroom as a center and as a whole classroom activity.